So I am home alone for a couple days and ways thinking of going out to eat. Wait!! Why go out when I can make a great restaurant meal without spending the money. Check the fridge, take inventory, get plan…. The sauce can easily serve 2-4 chicken breasts but once you have an idea on how to make you can scale down to how much you need. I was making one chicken breast but I will give you the measurements for 2-4 servings. 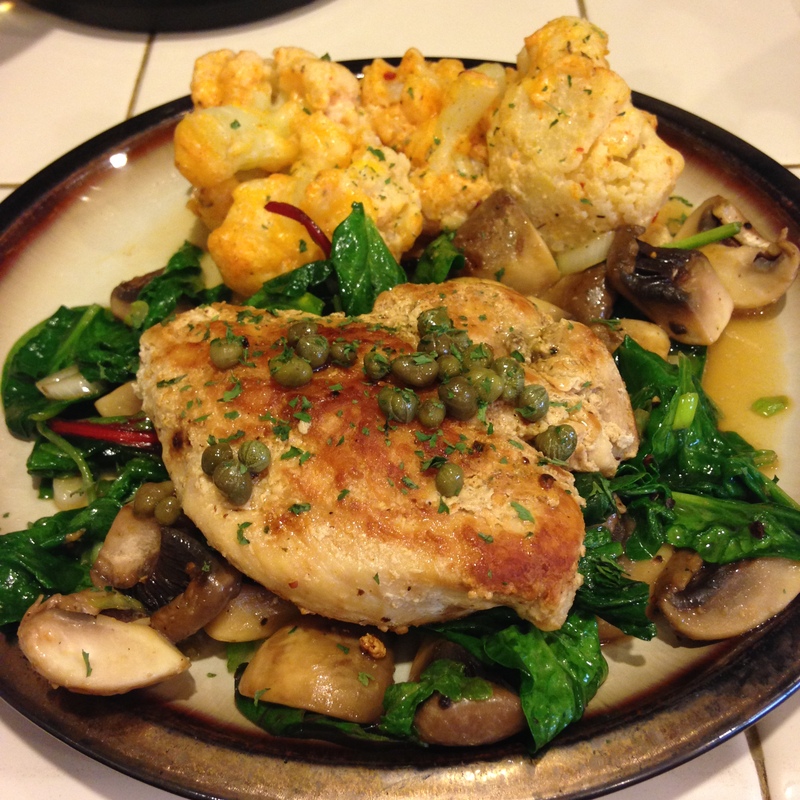 Most Piccata recipes will have you dredge the chicken breasts in flour. I am choosing not to do that in this recipe. If you do I always seasoning my flour with at least salt and pepper but never be afraid to add some paprika, thyme or garlic powder. Heat a skillet with about 2 Tablespoons of Butter. Seasoning chicken breast with salt, pepper and garlic powder. Brown in skillet with butter. Add olive oil if needed. To skillet add lemon juice, broth/wine mix and capers. I use a lot of capers but add the amount you like. Simmer about 5 minutes. I was making enough for one so I used 4 med mushrooms and one green onion with a handful of greens. You can serve separately but I placed the wilted salad down on the plate with the chicken breast over top. The Piccata sauce on top of the chicken and sprinkle with parsley. Enjoy with a nice white wine!!! I certainly did. 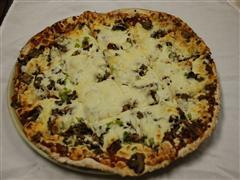 Big Fred’s Pizza located at 1101 S. 119th St in Omaha has been family run since 1965. I had heard a lot about Big Fred’s when I first moved to Omaha and didn’t know what to expect. Big Fred’s is like walking back in time to the 1970’s. It is very family oriented and a friendly place. You can sit back and have a good quality meal. I just love restaurants with a bit of nostalgia, as it adds to the experience. I admit I haven’t tried much other than the pizza, wings, salad and beer but what else is needed? They do have other selections and I know people go there for the pasta selections, sandwiches and prime rib too. The pizza is ‘home-style’. Living around the country I have noticed differences in pizza. I am a fan of traditional to thin crust pizza. Big Fred’s pizza is what I would call a traditional crust. It is square cut which I have always found odd but to each their own. The one thing I have noticed about “Omaha Pizza” is the cheese is on top. The problem with this style—the toppings slide off!! I don’t know about you but there should be some cheese on the base to hold the toppings to the crust. You don’t have to worry about them skimping on your favorite toppings…that is definitely a plus in my book. The one thing I wish they would change…use fresh mushrooms. Unfortunately, they use canned mushrooms which maybe is part of the nostalgia but I am not a fan. Their house salad dressing is delicious and the perfect balance. The salad is a simple no frills mix, but is usually over dressed; ask for the dressing on the side. If you enjoy the salad dressing you can purchase it at the store or at the restaurant. The wings are a traditional tabasco vinegar based hot sauce. They come as a baker’s dozen and are a large size. If you are craving a basic hot wing with no crazy sauce choices these are perfect for you. If you are looking for a low key place to take the family, watch the latest sporting event or just to have a good reasonable meal come to one of Omaha’s landmark restaurants. I love my crockpot! I actually have 2 larger ones and then a mini one. It is so great to get it ready in the morning or even the night before then start it in the morning. I want to make sure I this about croc pots. Know your crockpot. I have one that even on low it is like cooking on high. I suggest if you have never cooked with it then use it the first couple times at home so you know just how high your settings are. Trust me I put my spaghetti sauce on low and came back to it being scorched on the bottom. Now that could be because it was an older crockpot but I always check out my new ones while I am in the house. Cut stew meat into sizes you prefer. Heat oil in skillet and brown meat. Set aside. When using the crockpot for best results always brown you stew meat/ roasts before putting into crockpot. Add all your vegies to the crockpot. Feel free to chop the vegetables to your desired size. Some people like hearty thick pieces and others prefer smaller bite size. The jalapeno I would keep small. Add your broth. For more of a rich beef flavor you can use beef stock. I don’t routinely keep beef stock in the pantry so I use what I had on hand. Note: If I was using beef stock and had a little red wine on hand you can add that too. Add the rest of the ingredients and the browned meat. Set on low for 8-10 hrs or High for 4-5 hrs. NOTE: Remember you can add more vegies if you want. I used what I had in the fridge which is why I added the jalapeno and the cup of spaghetti sauce. The spaghetti sauce I figured took the place of tomato paste and additional seasonings. Don’t forget to TASTE. Periodically test your stew. 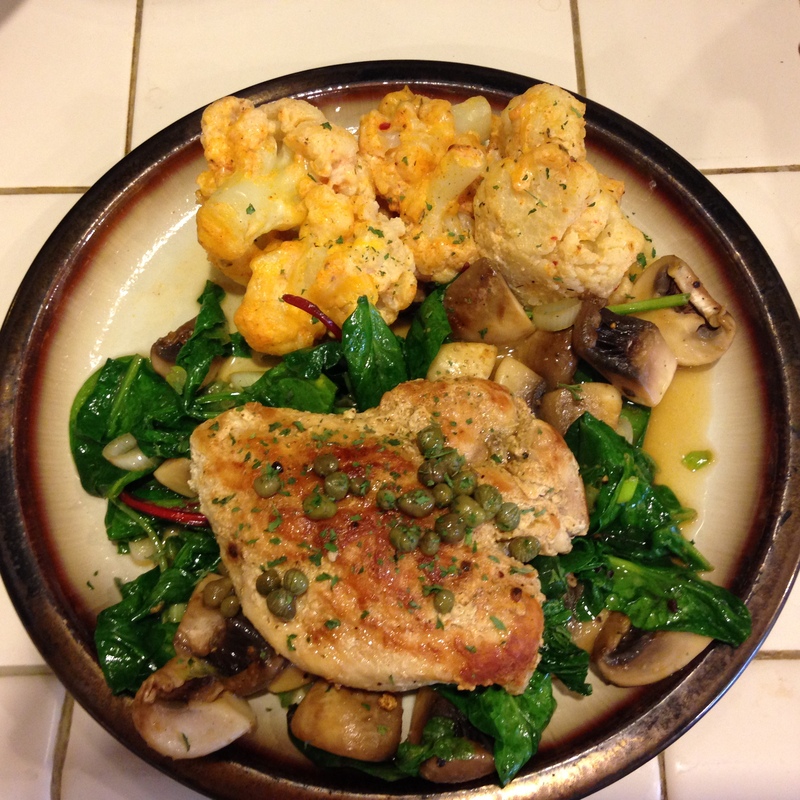 The flavors will develop as it is cooking throughout the day but you can add seasonings. So you say you can’t cook? You are afraid to deviate from a recipe? Let’s start changing that today with some simple tips and encouragement. Cooking is like art. It is fulfilling to see what you created when you are done and to see others enjoying it. You don’t need to have fancy ingredients or have gone to cooking school. My Dad was a cook in the Coast Guard and learned how to put together meals for his peers. You use what you have. I also learned this from my grandparents in Alaska. You never waste anything and we can feed an army (ok well large family) on the staples in the house. We were not rich and growing up in the 70’s trust me I had my share of casseroles and Jello molds. I am still a big fan of casseroles and stews/ soups as you can take those leftover ingredients in your fridge and raid your pantry and come up with one hearty meal. I think it is only fair to share with you some of my favorite humble dishes from the past. I look in the pantry and all I see is a can of Franco-American spaghetti. My parents wanted to elevate it and make it more into a meal that can serve us. Brown some ground beef with onion in a pan- add the canned spaghetti. Done. Spam- Yes, that canned meat. We had a lot of spam, usually sliced and browned and eaten as a sandwich with mustard. Now I don’t know exactly how my mom made this casserole dish but she used the electric skillet. I want to say it included a layer of sliced potatoes, a layer of sliced onion, and spam. I am not sure what else but used to be something we ate a lot. The simplest of Shepards Pie…ground meat and corn mixture covered in mashed potatoes. YUM. Mrs. Thatcher made this simple dish the best!!!!! So now that I reminisced a little let’s back to encouraging you not to be afraid of the kitchen. Recipes are guidelines (except for baking). With computers these days you can find easy substitutions for something you don’t have on hand. Think of it this way: How can there be so many recipes for the same dish? Everyone uses different amounts and maybe different spices. So don’t feel like you have to measure everything exactly or you don’t have a certain spice so you can’t make the dish. Start small. Spaghetti sauce. If you are afraid to make from scratch (it is easy by the way) then buy a cheap store brand and then make it your own. Add your own spices (thyme, basil, oregano, Italian seasoning), maybe add some spicy peppers or red pepper flakes to kick it up. I always add about a cup of red wine. Experiment! You see the sauces at the store with vegetables in it so cut up your own and sauté and add to your sauce. By switching out the meat if making a meat sauce will change the taste…you can use the ground beef but you can also use any ground meat or a combination. Crumble some cooked sweet and hot Italian sausage in the sauce. I usually make my sauce from scratch but I have had to use a store bought one in a pinch and always make it my own. My sauce never tastes the same as I use what I have on hand. Simples switches: When making rice you can substitute a stock. I recommend chicken or vegetable stock. It will impart some of the flavor into the rice. I sometimes even add in some diced onion, tomato or a package of Goya seasoning into the water. I know a lot of people are afraid of cooking rice. Maybe because we had rice at every dinner in Alaska (Filipino and Tlingit Indian heritage) but rice is very easy. Here is my way: 2 cups of liquid (water or broth), bring to boil, add 1 cup of white rice, turn heat wayyyyyy down to low, cover. Should be down in about 20 minutes. Recipe calls for white wine and you have none- use chicken broth. Speaking of cooking with wines. Don’t waste your money on small bottles of cooking wines. I keep a big bottle of white and red drinking wine. Yes and it can be a cheaper brand. Also, you can buy the bigger bottles of Marsala and Sherry in the wine section. I add red wine to my spaghetti sauce and chili. You can also make a quick marinade using some red wine, olive oil and seasonings for red meat. White wine I use when making pan sauces for chicken, pork, and fish. It also can be used in making of a marinade for chicken or pork. Of course, you can also use the handy salad dressing as a marinade. Don’t have sour cream or plain yogurt: you can substitute each for the other. The most important thing is knowing the basics. For example realize that if you use 1% milk you are not going to get a rich creamy texture as you would using whole milk or cream. I have substituted using 1% and heavy cream or half and half when I didn’t have enough whole milk. Always taste your food as your cooking. This is your friend and best tip. You can adjust seasoning as you cook. Using canned products? Just remember that usually a lot of salt is added. You may need to rinse off the product. If I am using any canned beans I always rinse. This doesn’t include baked beans or beans in a chili sauce. Sauce too spicy and you want to sweeten a little—add honey. Salt is your friend but don’t add too much too early as you may end up with too much. Salt brings out the flavor in food. You can always add a little at the end. I try in my recipes to give helpful tips so read my posts, get creative and start to enjoy cooking. The Rusty Nail in Omaha is your typical neighborhood gathering place located at 142 Pierce Plaza (located in same area as Dunkin Donuts). I would describe it as rustic. The interior could use a makeover but that is just aesthetics. They offer a lot of food and bar specials along with weekly events. Check out their webpage for more information. I don’t know if they know how to make a “Rusty Nail” (Scotch and Drambuie) but if you want a cold beer they definitely have that. Our bartender, Amy, was very friendly. It appears that a lot of the patrons were regulars as Amy knew them. The Rusty Nail has an outdoor patio for those that need a smoke break or a bit of fresh air. We stopped in for a couple beers and a snack. They only have 4 draft beers but more beers in the bottle and a full liquor bar. Oh and I got to play a little Keno too. Made back all but $4.00- not to bad. When our burger came out it was already split for us on two separate plate each with its own lettuce, tomato, onions and pickles and generous amount of fries. We didn’t ask for this so this was outstanding customer service!! I was very impressed. The burger appeared to be hand formed and seemed like a 1/2 lb. We were not asked how we like it cooked but it came out a perfect medium with just the slightest of pink. It was juicy and seasoned well. The fries I could eat again and again. There is nothing better than hand cut fries and I would bet they double fry them for the perfect texture. I haven’t tried any of the other food but I will be back for their burger and fries. The one suggestion I would make for the Rusty Nail is to have a signature drink menu….obviously a Rusty Nail has to be on there, but for some reason I picture a signature Bloody Mary. I tried there Bloody Mary and it was ok. I did like the fact it was served in a mason jar and Amy asked if I wanted salt around the rim, but they used a mix. I want to see a homemade Bloody Mary (can’t give away my recipe…saving that although I may give another version in another post) or at least give the customer the condiments to add. Anyways, check out The Rusty Nail’s website and pay them a visit. You won’t be sorry —this may be your new neighborhood bar. All great dishes start from humble beginnings and every cuisine has their own. I am sure everyone reading this has started a dish with one of these three bases sautéed in butter or olive oil in a 2-1-1 ratio. Mirepoix: If you cannot guess from the name this is French. It is using the basic ingredients of diced onions, carrots and celery. I use this when starting all my stocks and soups. Typically, you would butter for a mirepoix. Trinity: When I think of the trinity I think of Emeril Lagasse and his references to it in his Cajun and Creole cooking. This again uses onion and celery but then swaps green peppers for the carrots. I have seen recipes using olive oil, butter or combination of both to sauté. Sofrito: Lastly, we have the Spanish version using onion, garlic and tomato in olive oil. These aromatic mixtures will develop your dishes right from the beginning. You will want to add black pepper and a little salt. Be careful with the salt as if you add too much or too early it will get watery. Salt draws out water from the vegetables. If you want to add a sweetness from your base you can start the onions first and then when they start to caramelize add the other vegetables. Now you know the names of the humble beginnings I am sure you all have been using. One last tip: If you are reading a recipe and it says to use a medium dice you may be like well what is medium? A medium dice is 1/2 inch X 1/2 inch X 1/2 inch. Are you looking for that ‘naughty’ dip to bring to your next potluck? I had this at a party and it is addictive!!! So beware. 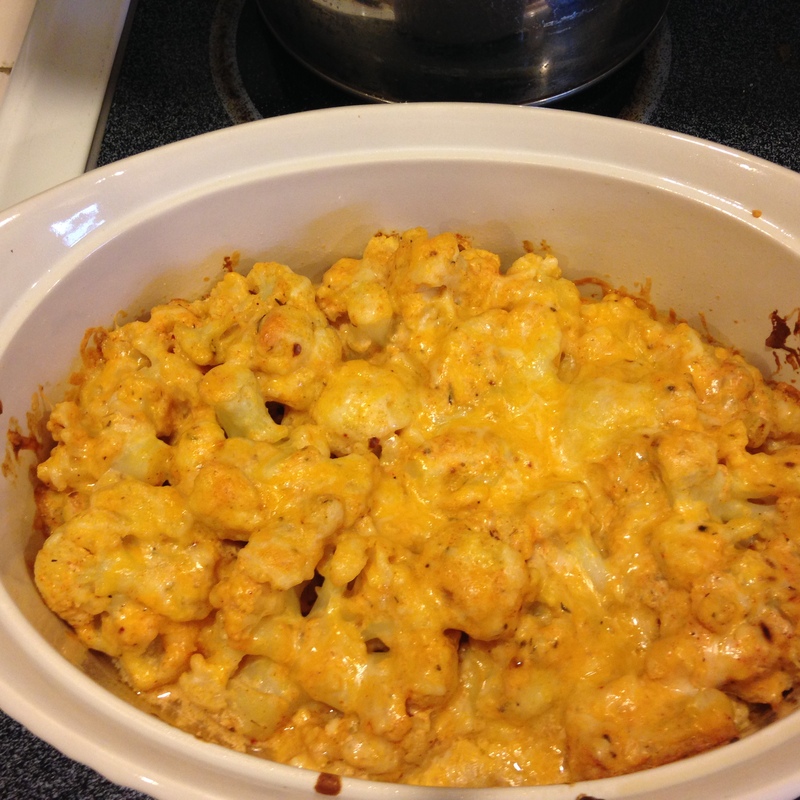 The original recipe is from Taste of Home 2013 submitted by Mandy Rivers from South Carolina. I wish I took credit for this but it was so good I had to share and give kudos to Mandy. Absolutely delicious. Preheat oven to 375 degrees. In a large skillet, cook sausage, onion, and garlic over medium heat until sausage is no longer pink, breaking up sausage into crumbles; drain. Stir in wine, oregano, salt and thyme. Bring to a boil; cook until liquid is almost evaporated. Add cream cheese; stir until melted. Stir in spinach, beans and tomatoes; cook and stir until spinach is wilted. Transfer to a greased 8 inch square or 1-1/2 qt baking dish. Sprinkle with cheeses. Bake 20-25 minutes or until bubbly. 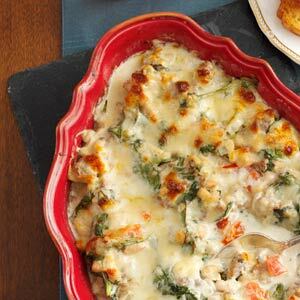 Serve with crackers or bread. Again I hope you enjoy and give credit to Mandy if sharing this wonderful dish.